Phoenix canariensis is endemic to the Canary Islands and can be found used throughout warm regions in the U.S. as an iconic tropical specimen. This massive palm slowly reaches 40-50’ tall at maturity, but has been found growing larger in some situations. Canary island date palm has a rounded canopy with deep green, and somewhat sharp, pinnate leaves that can reach 8-15’ in length. This single trunk palm has a base that can reach 2-3’ in width, but they can grow larger with advanced age. This palm produces flowers in the spring, followed by fruits in fall that ripen to an attractive orange color. Though fruit is edible, they are not very palatable. This palm is not self-cleaning, so some continued maintenance is required to keep old foliage removed. Diamond shaped scars left behind from spent leaves add in an attractive feature to the leaf base of the palm. When planting Canary island date palm, be sure to improve soil drainage, as plants do not tolerate wet feet. 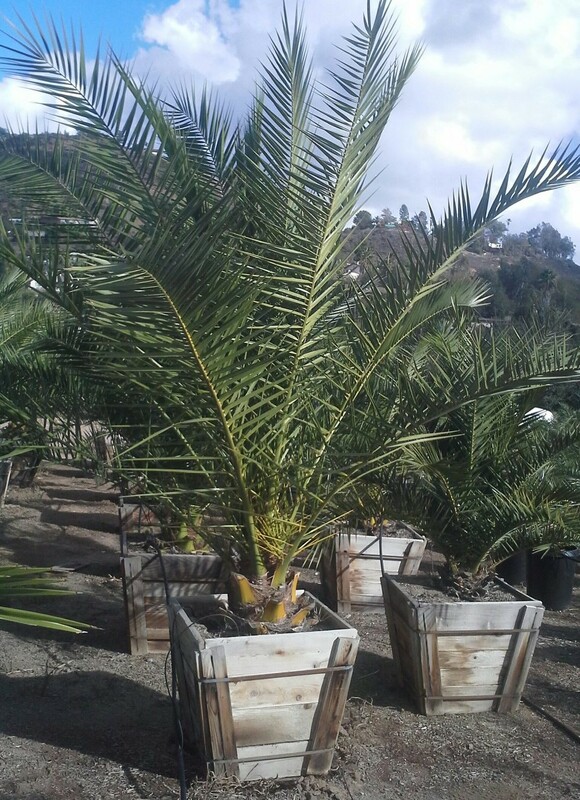 This palm doesn’t mind humidity or air salinity making it a great choice for coastal and Mediterranean landscapes. Plants can, however, have issues with fungal spots and they are sensitive to trace mineral deficiencies. Plant in a sunny location and fertilize regularly for optimal health and vigor.